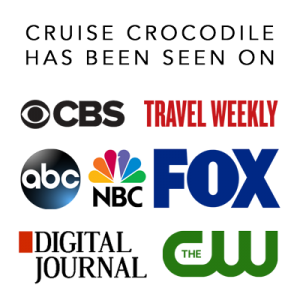 Our Mumbai cruise port guide gives you information about the docking location, cruise dock, transportation options and much more! Welcome to the Mumbai cruise port guide. Mumbai is one of the most hectic and craziest cities you could ever be in. It is raw, loud and polluted. Whatever senses go off in your head, that feeling doesn’t go away. Mumbai is not something to see, it is something to experience. The most fascinating realisation is how Mumbai works. The city is situated on roughly 233 sq miles and on this tiny area there are 12,5 million people living on it. That is almost 54000 people per square mile. How do these people make it work? How is transportation even possible in this chaos. How can anything be origanized in the mess? Well, it works and this is simply something you cannot wrap your head around. Mumbai takes you away on a ride you will never forget, whether you are going to be enchanted by the the traffic, going into the safe zones of the museums or going full on for Mumbai’s markets. Set aside your standard of hygiene, your preference for peace and quite and open your arms for Mumbai! 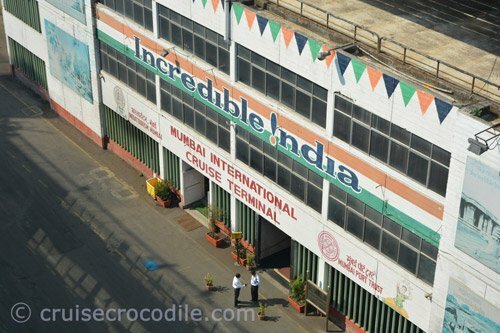 This is the cruise terminal in the Bombay port trust to welcome you to Mumbai. Inside the cruise terminal there are different facilities. The Green Gates are usually the exit of the port. This is where the shuttle bus will drop you off and where you will find taxis and public transport. 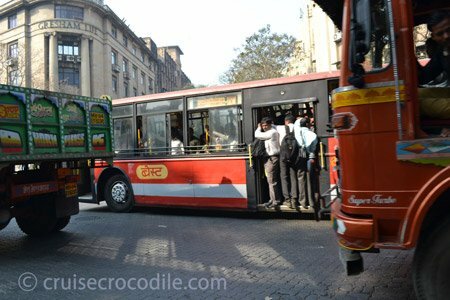 The public transport of Mumbai is extensive, but adventurous. This bus leaves from outside the gates. In Mumbai your cruise ship will dock in Bombay port trust. There are several options of where your ship will dock, but if you are the only one in town it is a safe assumption you will dock at the passenger terminal. 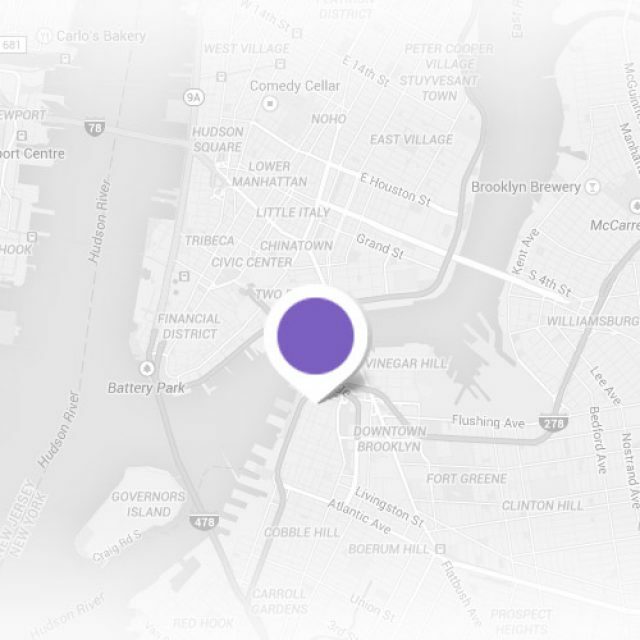 See map above for its location. Once your ship is docked get yourself on the outside deck to get that first impression on mighty Mumbai. When you step on to the dock you will find that there is a passenger terminal waiting for you there. This will be several facilities here. Services change per call, so we’d rather make no promises. Walking in the port is prohibited so the ship will provide a shuttle bus to bring you to the exit of the port. Bombay port trust has several exits in the port area. All exits refer to a color. Try to remember what color gate it is that you have to enter to get back into the port. If you dock at the passenger terminal you will most likely use the Green Gates exit. And yes, the gates are green. 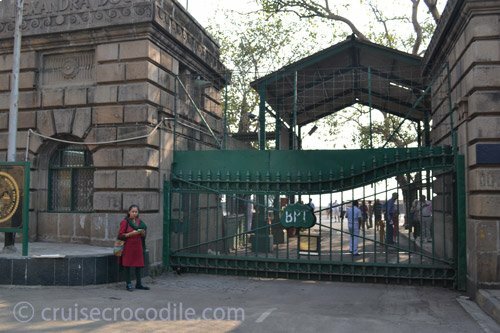 See the picture of the gates underneath. Taxis will be waiting for you at the green gates. These taxi drivers are there to try to sell you the taxi tour. For about 4000 Rs. (+/- 65 USD) a day this man will take you anywhere. It could be that they’ll offer it for a cheaper price, but also keep in mind this man needs to make a living. These guys usually do not take short rides on the meter, so if you just want a one way cheap taxi walk further up the road until you can hail one on the street. There are 2 types of taxis you can use in Mumbai. The traditional yellow/black taxis that do not have air conditioning. A ride with these taxis costs you about 50 Rupee to get to Crawfort market for example or 100 Rupee to get you to the other side of town. These taxis have meter so check if it is on, but they are usually pretty descent with it. You can also take the blue/silver taxi. This one is also official, but the main difference is that this is air conditioned. Expect you pay about 30% extra compaired to the traditional taxi. Whatever you do it is wise to just step into a taxi and check if he hits the meter than to start bargaining about how much USD a ride would cost. – People hassling for money is an unfortunate fact of life in Mumbai. A firm but friendly NO should be enough to stop harassment. – Plan your bathroom stops. There is not always a clean and proper bathroom around, but you can expect them at the nicer hotels and museums. – Traffic can be very chaotic so watch the time. – Is if safe to walk in Mumbai? Yes, it is. It might not feel so comfortable especially in the beginning, but let’s say you are up for an adventurous walk. – Do taxis run on the meter? Yes, they do. The taxis at waiting at the exit of the port are there to make a deal with you, but the taxis you’ll find in town always automotically will start on the meter. – Is there a hop on hop off bus in Mumbai? Yes, there is. It is not waiting at the city gates though and even if you manage to catch it is more a city tour than a hop on hop off bus. This bus would not be something we would recommend as it has no convenience for you. – Can I pay the taxi in US dollars? Usually the taxi drivers at the exit of port will make a deal in US dollars for you. The taxi drivers in town usually only take Rupee. – Is Mumbai safe at night? Yes, it is. You will always have your usual city safety issues, but in Mumbai there is nothing to be extra alarmed about. The church gate station is next to Victoria station a mayor transportation hub. Why not hop on and take a ride to Mahalaxmi where you can find laundry service Dhobi Ghat. One of the most unusual mosques stand in Mumbai. Sometimes this location is visited by 40.000 people a day. You’ll need to plan your visit though. Only when the tide is low a causeway will reveal itself that runs up to the mosque in the middle of the sea. It’s not just the mosque that is the main higlight, it is everything you will see on your walk to the mosque. From the exit of the port it is 7 km / 45 min. drive to the north. Expect to pay 130 rupee for a taxi. When you are going out for dinner in Mumbai you need to take a couple of things in mind. Everything you would look for in a local restaurant is what you’ll find at Khyber. Great staff and delicious food! From the exit of the port it is 2 km / 20 min walk west. The former auditorium is nowadays the NGMA (National Gallery of Modern Art). It hosts various exhibitions and art collections of famous artists and sculptors. From the exit of the port it is 2 km / 25 min. walk to the south. Expect to pay 50 rupee for a taxi. Chhatrapati Shivaji Maharaj Vastu Sangrahalaya or also known as Prince of Wales museum. This world famous museum is India’s premier art and history museum. India’s rich heritage is being displayed over several floors in the old Indo-Saracenic style of architecture. Make sure not to miss this one. 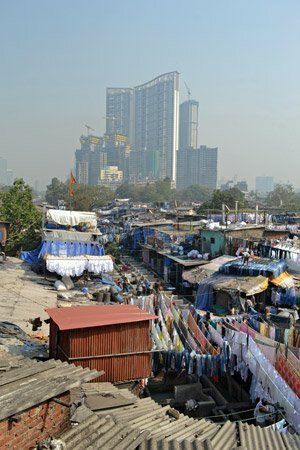 More than half of Mumbai lives in the slums and if you would look a little further than the common sights than you would be able to renew your vision on the world. At first sight, what seems like extreme poverty is also a chance for business. There are several guides from the slums who give tours through the Shanty area explaining the different economies that thrive here. There are so many markets in Mumbai. Find a special one that is of your interest or visit Crawfort market. This is the market that has anything and everything. From the exit of the port it is 2,5 km / 30 min. walk north or take a taxi for 50 rupee. This hotel stands next to the Gateway of India. It is the famous 5 star hotel built in 1903. It hosted notable guests such as the Beatles, Queen on Norway, Prince of Wales, Hillary Clinton, Brad Pitt, Oprah Winfrey and Barack Obama. Go inside for a high tea or a simple drink in the AC in this beautiful establishment. From the exit of the port it is 2,5 km / 25 min walk to the south or take the taxi for 50 rupee. Or also known as Chhatrapati Shivaji Terminus. This building from 1888 is a train station used by 8 million people daily. You could understand that this is a place to see people in their daily life or to enjoy this magnificent Victorian building. From the exit of the port it is 1,5 km walk to the north or take a 50 rupee taxi. This is the famous library and heritage structure from 1870 in Mumbai. It is one of the 145 old buildings which have been declared as protected monuments by the government. From the exit of the port it is 2 km / 20 min walk west. This is the signature landmark of Mumbai and a mandatory stop when in Mumbai. It was erected as a symbol to welcome Queen Mary and King George V of England when they paid a visit in 1911. It also has a ceremonial value, because this is where the last British troops departed from India. From the exit of the port it is 2,5 km / 25 min walk to the south or take the taxi for 50 rupee. Mani Bavhan is the old house of Gandhi. In 1915 Gandhi returned here from South Africa and became leader of the congress party. Nowadays it is the Gandhi museum in which the history of this man and the country are featured in excellent exhibitions. From the exit of the port it is 6 km / 30 min. drive north west. Expect to pay 100 rupee for the taxi. The world’s largest open air laundry. Where 1 million pieces of clothes are washed every day. It is like a soapy maze down there. There are over 700 basins where about 6000 people work every day. From the exit of the port it is 8 km drive north. Best way to get there is by train from Churchgate station or taxi. This is a 6 km long. C-shaped promenade in Mumbai. It is nicknamed the Queens necklace for the facts it lights up in the evening and this resembles a necklace. From the exit of the port it is 4 km / 20 min. drive west. Expect to pay 70 rupee for a taxi. Ask a taxi driver for Banganga in Teen Batti, Malabar Hill. Not all drivers will know it, but they try their very best to find it for you. This is the beauty of the Banganga watertank. There are hardly any tourists there. There is not an awefull lot to find in and around the watertank but it a beautiful example of real Mumbai. From the exit of the port it is 9 km / 45 min. drive west. Expect to pay 100 rupee for a taxi. Fort Bombay is the area you will walk into as you exit the port. Take a few hours to explore this neighborhood. It is only this way that you’ll understand the significant role that the British played not that long ago. The grand buildings you’ll find here tell the story of this colony that the British once saw as the most valuable land in the world. From the exit of the port it is a 5 min. walk into the centre of Fort Bombay. On top of Malabar Hill you’ll find Pherozeshah Mehta, (a.k.a. hanging gardens). It is famous for its animal shaped hedges. It is built on a water reservoir of Mumbai. From the exit of the port it is 9 km / 30 min drive to the west. Expect to pay 100 rupee for the taxi. 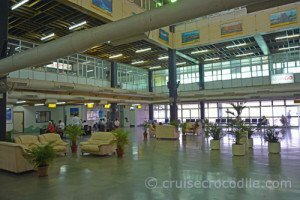 Mumbai is working hard on a new cruise terminal. 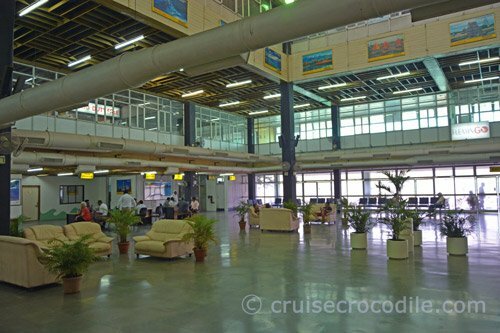 The current cruise dock of Mumbai offers several facilities like shops. Read the full Mumbai cruise port guide for all the information.